Every day is a new and different adventure. You will get your first taste of this when you are doing your live clinic training hours. When you work in the field of dentistry, every day is different. There are new challenges to meet and deal with every day. If you like dealing with the public, this a great profession for you. When you are still enrolled in school and are taking dental assistant training courses, your live clinic training will show you if you like this kind of work. Your work environment is pleasant. There are a lot of professions out there where the work is interesting but the workplace is sketchy. That cannot be said of employment at a dental practice. In some medical fields, the work environment is not as pleasant as in dentistry. Private medical and dental practices are quieter and less hectic than other areas such as hospitals or urgent care centers. For the most part, dental offices are calm and quiet.Your schedule can be flexible. Most dental practices have both full and part-time assistants on staff. That way you can decide what kind of hours you want to work. The training does not take years of your life. Training to become a dental assistant means you have to take classes and complete your live clinic training. For people who are looking to change their career after working for a while, this can be a great option. This is also a good career path for people who are just starting out. You do not need a four-year college degree. Only a high school diploma is needed for this kind of work. The programs are not as long as a dental school by any stretch. There are a lot of benefits and not so many drawbacks. Every job has good and bad parts of it. Dental assistants have said that they have more good days than bad. Dental assistants get to help people, the hours are great, and you can work with a number of different people. There are lots of opportunities to advance in your career. There are people who are very happy working as a dental assistant and do it for decades. Other people like working in the dental industry enough to use the dental assistant position as a stepping stone to other opportunities. Some people go back to school to become a dental hygienist. You can make good money as a dental assistant. The salary you get will depend a lot on where you live, the kind of clinic or surgery center you work in, and the number of hours you put in every week at work. The bottom line is that you can make a good living working as a dental assistant. The more experience you get in this field, the more money you will take home. You have a chance to network with a lot of people. This is not a job where you are stuck in a cubicle, locked away from the world. This kind of job allows you to meet and work with a wide array of people. You will meet other people who work in your industry and that can help you take advantages of better opportunities. There are a lot of benefits to going into the dental industry. 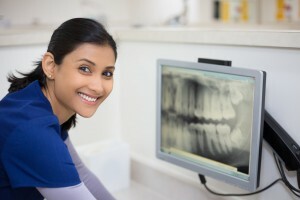 Becoming a dental assistant can open yourself up to a lot more opportunities and options than you might get elsewhere. The live clinic training you receive when you are on the path to becoming a dental assistant can transfer to a number of other industries and positions.